Ty is a simple #2 plastic shower curtain. Unlike other shower curtains made of vinyl, Ty will not off-gas in your home. Also unlike vinyl, Ty breathes – making it less likely to grow gross mold and mildew. Ty is stronger than vinyl and will last a very long time, then it can be recycled. Ty can be trimmed to size with sharp scissors and will not unravel. White with nickel plated brass grommets. 100% High-Density Polyethylene (HDPE) and nickel plated brass grommets. HDPE is one of the most commonly recycled plastics and is PVC free. Ty can be machine washed with a mild detergent. Washing will create a soft linen-like texture. Cold water only. Please hang dry. No iron. At the end of Ty's useful life, cut off the metal grommets and recycle locally. The rest of Ty can be recycled at a facility that accepts #2 plastics, or by returning it to Grain with the grommets removed at: Grain Ty Recycling, 12935 Islandcraft Lane NE, Studio A3, Bainbridge Island, WA 98110. Made to order. Please allow 2 weeks or contact shop@graindesign.com with special shipping requirements. Our Ty and Ty D.I.Y. 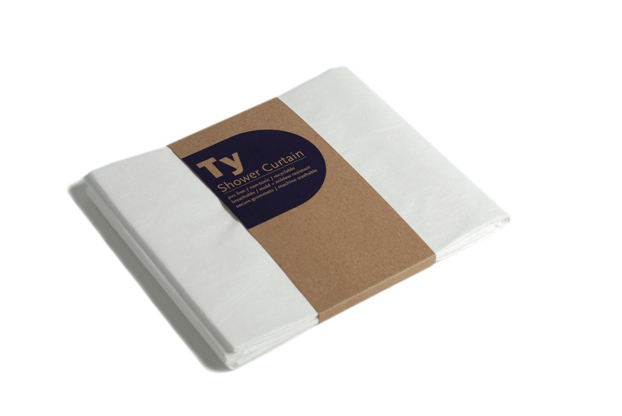 Edition shower curtains can be custom sized when purchased directly from Grain. Shower curtains are limited in one dimension by a 60 in length. For example, we can make a curtain that is up to 60 in wide and any length or a curtain that is any width and up to 60 in long. All custom sized curtains have a $10.00 cut charge plus an extra material charge if the custom curtain is longer in width or length than our standard curtain. Please contact shop@graindesign.com for more information. 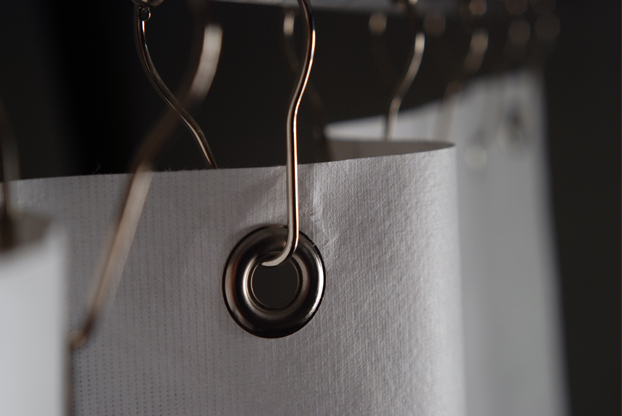 Learn more about the environmental/health problems associated with vinyl shower curtains here.